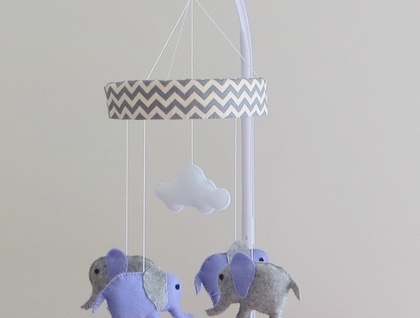 This lovely elephant mobile is handstitched, stuffed and strung by me. 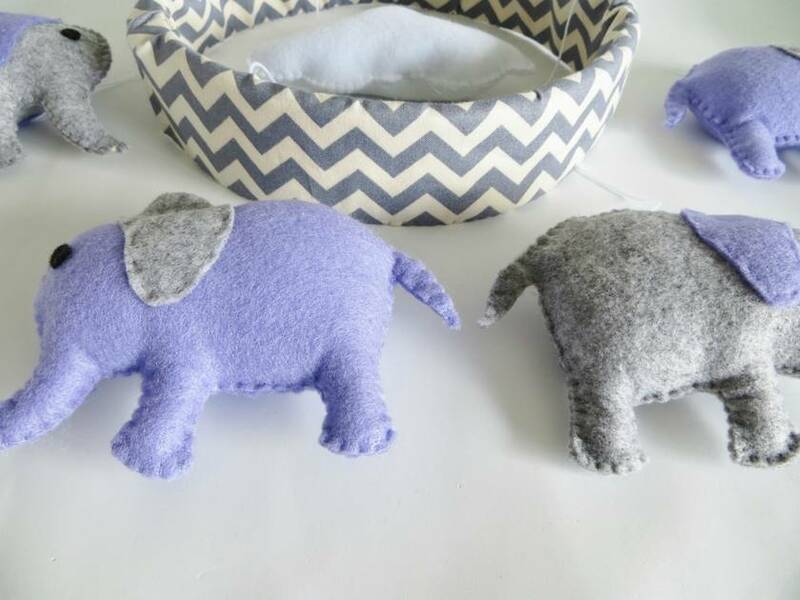 Each of the four elephants is made from a lovely wool blend felt and gently stuffed with polyfill, creating a soft look, perfect for a peaceful nursery. The cloud in the middle also adds to the softness. The items are strung with thick cotton and tied to a bamboo hoop. This hoop is covered with a grey chevron cotton material and handstitched around the bottom. It provides good contrast for you wee one as well as looking modern and chic. The mobile is evenly weighted and therefore bobs up and down when touched which gently entertains your little one. 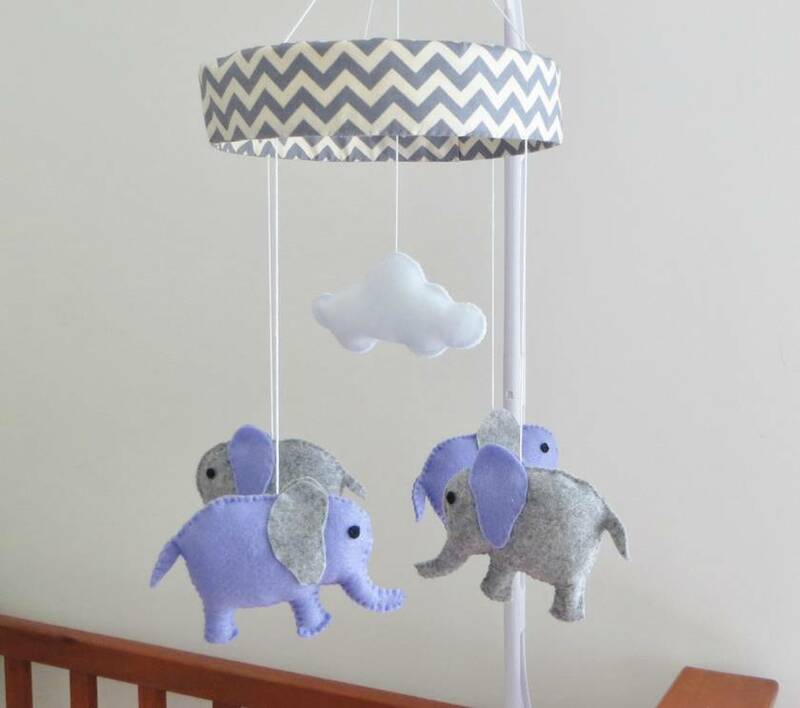 This gorgeous mobile would be a wonderful addition to your bub's nursery or a lovely unique gift for someone expecting. 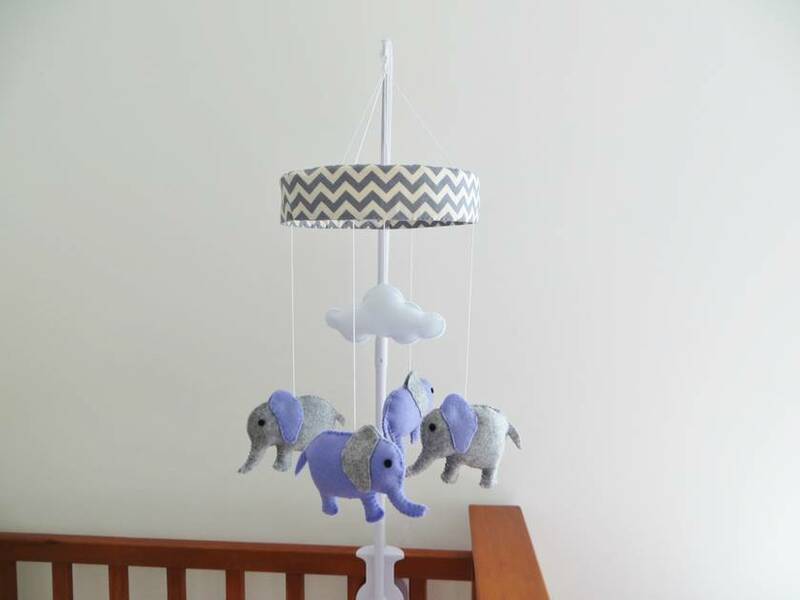 This mobile comes complete with a ceiling hook and 1.5m of the same thick cotton used to hang the items. This allows you to adjust the drop of the mobile to suit your needs. I also have plastic screw on crib arms available to purchase, please enquire for prices. A rotating music box can also be purchased to make the mobile more interactive, again please contact me for availability and prices. Each elephant measures - 12cm wide and 9cm high from foot to ear tip. The cloud is 13cm wide and 7cm high. The elephants drop approximately 25cm from the hanger. All mobiles are made to order meaning no two are ever exactly the same and are perfectly imperfect. I am happy to customise a perfect mobile exactly the way you want it, please contact me to discuss your requirements . Contact lovestrungnz to enquire about payment or shipping options.